This was a variation in my usual public appearance with the bike… a Friday night program for the general public and a detailed Saturday presentation for geeks. I had been based in the Santa Cruz area for a year or so, working on BEHEMOTH in a rented house up in the hills outside Soquel, and then moving to a lab sponsored by Borland International. While all this was going on, I was making random forays to speaking gigs, though still a newbie when it came to the business side of things. Memory of the Santa Cruz epoch is a blur of beaches, earthquakes, living with friends, dreaming of the ultimate geek bicycle, and writing. Ever wonder what it takes to trash your lifestyle and hit the road full time? 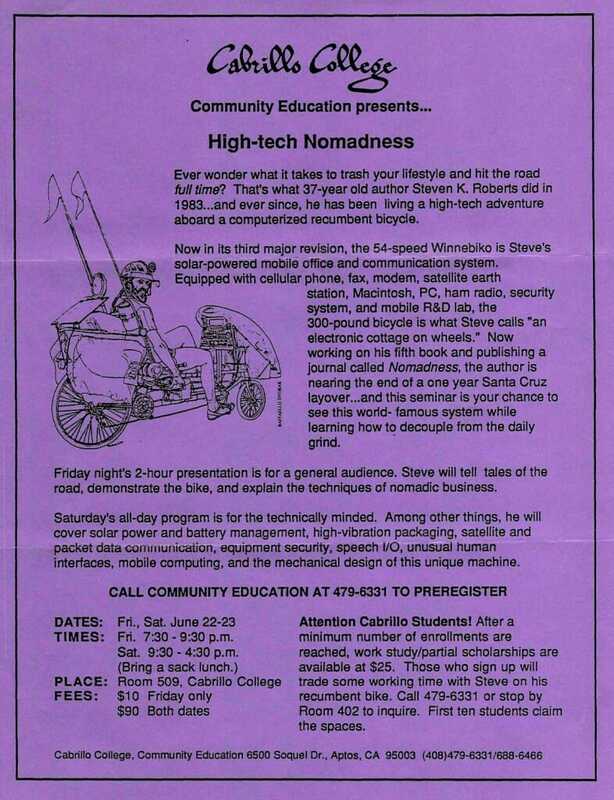 That’s what 37-year old author Steven K. Roberts did in 1983—and ever since, he has been living a high-tech adventure aboard a computerized recumbent bicycle. Now working on his fifth book and publishing a journal called Nomadness, the author is nearing the end of a 1-year Santa Cruz layover…and this seminar is your chance to see this world-famous system while learning how to decouple from the daily grind. 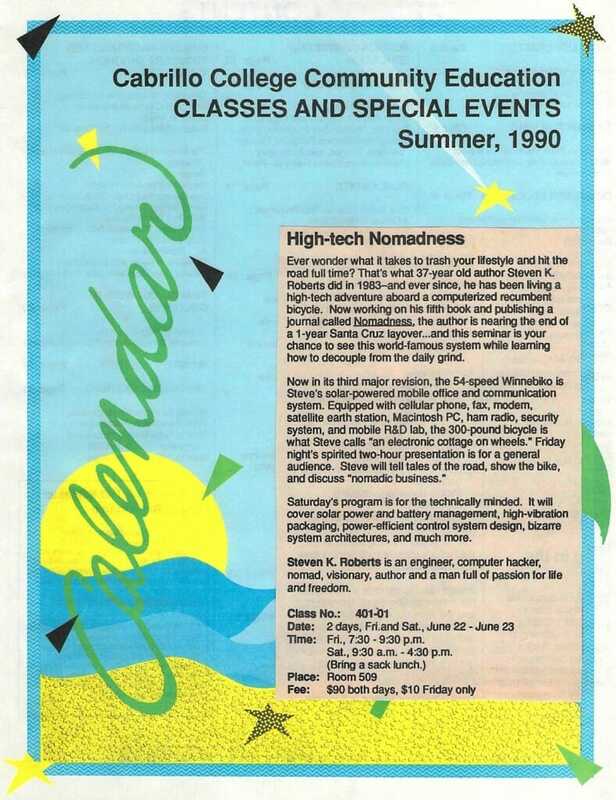 Saturday’s program is for the technically minded. It will cover solar power and battery management, high-vibration packaging, power-efficient control system design, bizarre system architectures, and much more. Steven K. Roberts is an engineer, computer hacker, nomad, visionary, author and a man full of passion for life and freedom. Time: Fri., 7:30 – 9:30 p.m. – Sat., 9:30 a.m. – 4:30 p.m.